Visual artists in our region are either not well known, or totally unknown, but many of us regularly exhibit in Switzerland or abroad. 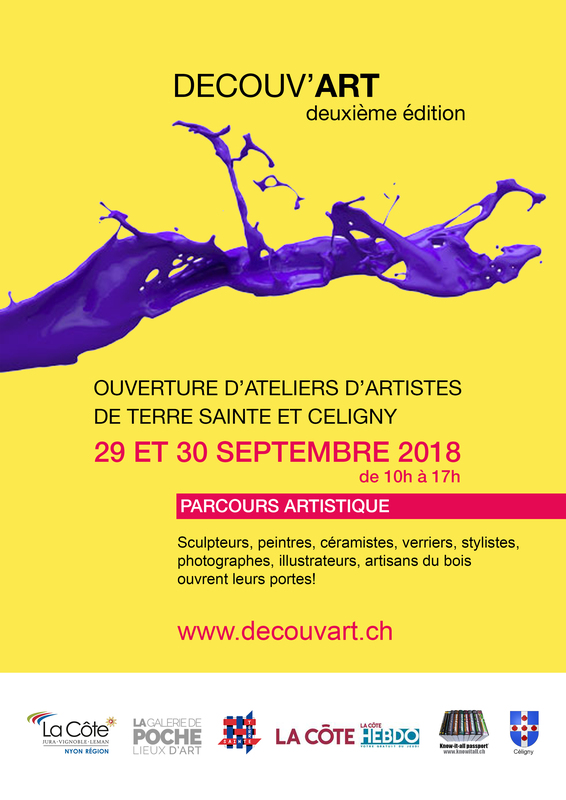 This is why we have organized an open workshop discovery weekend with the artists of “Terre Saint” (Bogis-Bossey, Chavannes-de-Bogis, Chavannes-des-Bois, Commugny, Coppet, Crans-près-Céligny, Founex, Mies, Tannay and Céligny). with a special opening on Friday 27th September for a number of school classes. The aim is to invite the public of “Terre Sainte” and the region, for the space of a weekend, on a discovery tour through the communes, to meet artists outside of museums and art galleries. Painters, sculptors, photographers, ceramists, glass artists, potters and wood artists open the doors of their workshop, to show the creative dynamism in our area. This artistic tour is an opportunity for the public not only to meet artists but to discover their world and to exchange with them on their sources of inspiration, their work or on techniques and materiels used.